Rendering of the Bangkok Thailand Temple, ©2018 Intellectual Reserve, Inc.
During his opening remarks at the Sunday morning session of the 185th Annual General Conference, President Thomas S. Monson announced the construction of the Bangkok Thailand Temple. The Church was formally organized in Thailand in 1966. Known as the "Land of Smiles," Thailand today is home to more than more than 22,000 Latter-day Saints in Thailand, organized in four stakes, 2 districts, and 42 congregations. 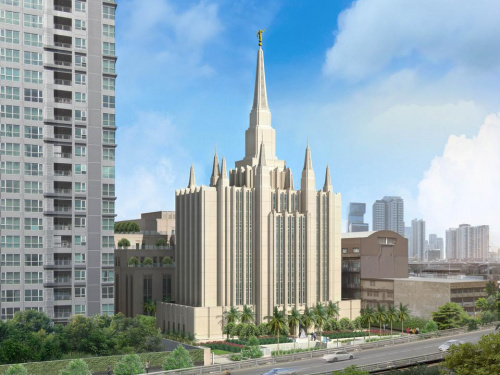 The Bangkok Thailand Temple will be the first Latter-day Saint temple in the country, serving members of the Church throughout Southeast Asia. Members currently attend temple worship services in the Hong Kong China Temple, over 1,000 miles away. Almost 20 years after the first stake was organized in Bangkok, Thailand, in 1995, the city’s second stake was organized on 15 June 2014, and its third on 27 November 2016. The first stake in Thailand outside of Bangkok was organized in Ubon on 14 June 2015. Two other districts operate in the country, headquartered in Chiang Mai and Udorn, which are expected to be reorganized as stakes in the coming years. In neighboring Cambodia, the country's first two stakes were both organized on 25 May 2014. Stakes have also been organized in the surrounding nations of India, Indonesia, and Singapore, and several districts operate in nearby Malaysia. President Russell M. Nelson and Elder Jeffrey R. Holland of the Quorum of the Twelve Apostles visited Bangkok, including the future temple site, last April as part of President Nelson's worldwide ministry tour. President Nelson said the Saints of Thailand will not be passive. He said, "These people are energized. They are inspired. They want to do something about their faith. They are going to get ready for their temple." Bangkok Thailand Temple site. Image from Newsroom. 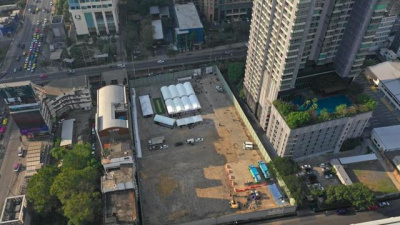 The Bangkok Thailand Temple will stand in a redeveloping residential and business district of Bangkok on the site of the current Church office building on Petchaburi Road. The property, acquired by The Church of Jesus Christ of Latter-day Saints in 2008, sits directly in front of the Makkasen Station on Bangkok's Airport Rail Link, making for rapid and dependable transportation from Suvarnabhumi Airport, which opened in 2006. The current Church office building houses most of the country's Church offices, including the Thailand Bangkok Mission, the Bangkok Thailand Service Center, the Bangkok Thailand PEF Self Reliance Center, and LDS Charities. The 44,405-square-foot, six-story Bangkok Thailand Temple will feature a grand central spire surrounded by eight smaller spires. A separate 91,370-square-foot multipurpose building will stand behind the temple, housing two church meetinghouses, an area service center, Seminary and Institute classrooms, and Mission offices and living quarters. An extensive underground parking facility will also be available. The Bangkok Thailand Temple will be the first temple built in Mainland Southeast Asia. The Bangkok Thailand Temple is the only temple with nine spires—a central spire surrounded by eight smaller spires. On 12 June 2000, President Gordon B. Hinckley became the first president of The Church of Jesus Christ of Latter-day Saints to visit Thailand where he enjoyed a "pre-birthday" celebration hosted by Deputy Prime Minister Bhichai Rattakul. The next morning, he met with Bangkok Governor Bhichit Rattakul and Thailand Prime Minister Chuan Leepkai who thanked him for all the work that Latter-day Saint volunteers had done for Thailand, noting, in particular, the 100 volunteers who had taught more than 300,000 English teachers and students over the previous three years. Bangkok was the second stop in a tour of Asia and the South Pacific to dedicate four temples: Fukuoka Japan Temple, Adelaide Australia Temple, Melbourne Australia Temple, and Suva Fiji Temple. Before leaving Bangkok, President Hinckley addressed a congregation of over 2,600 members at the Thailand Air Force Convention Center. Some members had traveled 18 hours by bus to be in attendance. In his remarks, President Hinckley recalled his first visit to the country in 1961 when there were just a half-dozen members of the Church. By 1966, President Keith E. Garner of the Southern Far East Mission had organized the Thailand District. President Hinckley returned in November of that year to dedicate modern Thailand for the preaching of the gospel. He said, "We went quietly in the morning into Lumpini Park, a small group of us, including Elder Marion D. Hanks of the Seventy, and there we lifted our voices in prayer. We prayed that the Lord would smile upon this land, that He would touch it by the power of His Holy Spirit, that the way would be opened for missionaries to come here, that the faithful would accept the truth, and that the Lord would do a great and good work here." He continued, "Now it's been a long time since I was here, and I have seen a miracle, a very real miracle." He told the members that they were pioneers of the Lord's work in their country and promised that if they were faithful, the time would come when a temple would be constructed in Thailand. "The Lord expects so very, very much of you. He expects you to be the best people in all of Thailand, and you ought to be because you have a knowledge of His everlasting truth." The First Presidency of The Church of Jesus Christ of Latter-day Saints has announced that the official groundbreaking ceremony for the Bangkok Thailand Temple will be held at 10:00 a.m. on Saturday, 26 January 2019. The ceremony will be held at the temple site, which is located at 1645/6 New Phetchburi Road Makkasan, Ratchathewi, Bangkok 10400 Thailand. Bangkok Thailand Temple groundbreaking ceremony. Image from Newsroom. The Church of Jesus Christ of Latter-day Saints broke ground for its first temple in Thailand on Saturday, 26 January 2019. 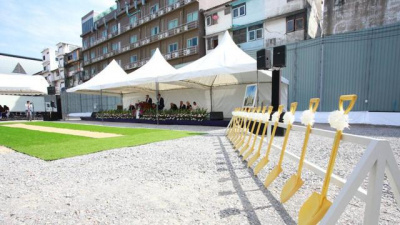 According to the Church's newsroom, the groundbreaking took place at the temple site on 1645/6 New Phetchaburi Road, Makkasan in the Ratchathewi District, which is in the center of a residential and business area in Bangkok. Elder Robert C. Gay of the Presidency of the Seventy presided in the ceremony with 700 members from the Church. Many others joined via broadcast in Church meetinghouses throughout the country. During his remarks, Elder Gay said, "My heart is filled with joy and gratitude to be here today. Because of the faithfulness of the saints in Thailand, a house of the Lord will soon be built in this country and many will have the opportunity to participate in temple worship with their family and partake of the eternal blessings that come with it." Elder Gay was joined by Elder David F. Evans, President of the Asia Area, who also offered remarks and the dedicatory prayer. Other senior Church leaders included Elder Peter F. Meurs and Elder David P. Homer, members of the Asia Area Presidency, as well as Elder Wisit Khanakham, an Area Seventy. Elder Evans said, "Today was a historic day for the Church in Thailand. For more than 50 years, the faithful saints in Thailand have waited and prayed for this day. The construction and ultimate completion of the temple will become a blessing for not only the members of the Church but also for all who see the beauty of the temple and feel of the peace that will be found on this sacred ground." Also in attendance were former Thailand Ambassador to the United States His Excellency Sakthip Krairikshand, his wife M.R. (Lady) Benchapa, former Mayor of Bangkok Dr. Bhichit Rattakul, and other dignitaries. Reflecting on the night that the news was heard about that a new temple would be built in Thailand, returned missionary Noah Purser said, "We couldn’t believe it, and along with all the members, we were dancing and jumping with joy. It was electric, and all anyone could talk about for the next few months was the temple. Since then, there seems to have been a change in how members approach preparing themselves for temple worship." A Thai member of the Church, Sister Wipharat Uanphoklang, a wife and mother of three sons, also offered remarks at the groundbreaking ceremony. She said, "We have long prayed for a temple in Thailand. We are grateful that each of our children will have the blessing of receiving their temple ordinances and being sealed when they go on missions and marry. The temple gives us joy, and hope as we seek to teach our children and help them feel of God’s love for them." Open house dates will be announced and public tours conducted after the construction of the Bangkok Thailand Temple is completed. A date for dedication will also be announced. This page was last edited on 5 February 2019, at 08:32.